One of the best times to buy a house is the end of summer, prices decrease while the market is more saturated, but families are still looking to move into their new dream home before the school year begins as to not disrupt their children’s education. You can help keep your price from dropping though if the two toughest rooms in the home look brand new. Those two rooms are your kitchen and bathrooms, which can look overworn, out of date, dingy, or old. But you don’t have to invest in a large amount of money or time to give your bathroom and kitchens a much-needed facelift which could result in a higher return in your selling range. Hiring Miracle Method is one way to help you sell your house with a kitchen and bathroom update, but there is more you can do to help sell your home quickly and for a profit. Just in time for the end of summer buyers season. Even if you are too busy to update and improve these hassle areas of the home, you can hire a professional to make the areas look so new, you might find it hard to leave home once it sells. But where to begin when trying to make the home more inviting? Start simple and make things neutral and natural with the below tips. 1. 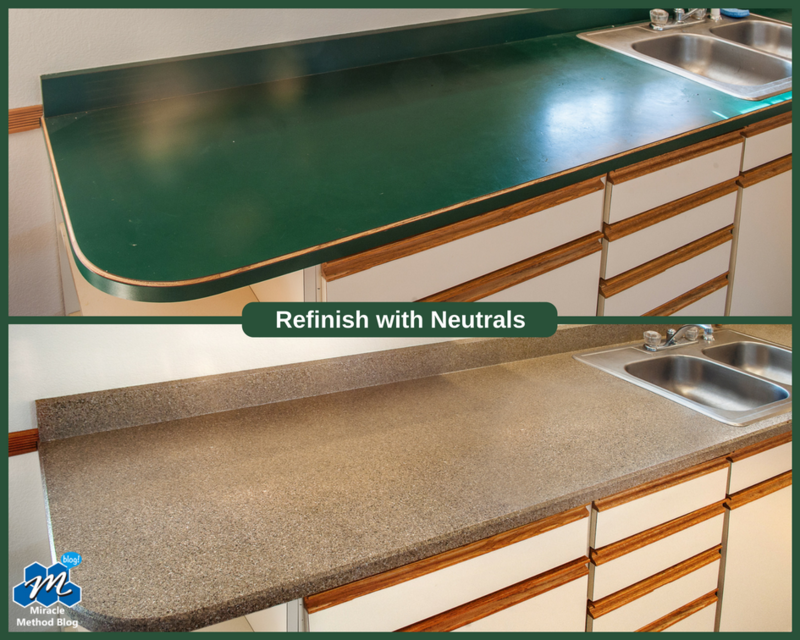 Refinishing – If you have painted the bathroom or kitchen in your favorite colors, consider refinishing the countertop in a more neutral color. Lighter colors work much better for both areas, and they will also help make the space seem larger. The fresh natural colors could be exactly what the area needs to make a new homeowner fall in love with the space. 2. Repairs – You don’t want to show a home that has broken tiles or problem areas. Repair any leaks and/or cracks that you may find in the faucets, bathtub, or tile. A great option is to have the ceramic tile in your kitchen or bathroom refinished for that instant updated look. 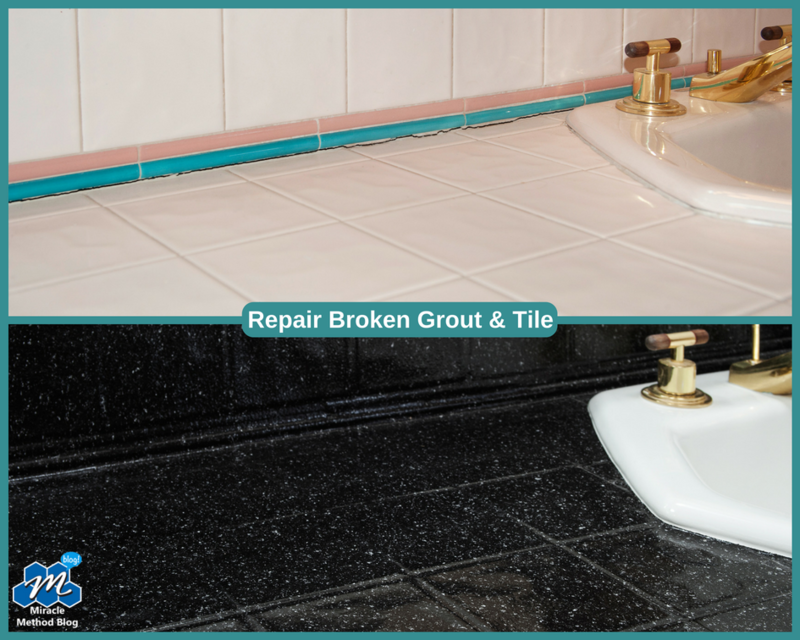 When you hire Miracle Method, we repair broken tiles as part of our refinishing process. 3. Clean the Floors – Give the area that extra sparkle before showing and open houses. Properly cleaning the bathroom and kitchen floors will make them as presentable as possible. Ceramic tile floors can be refinished, however, it is not advisable to refinish tile entryways where abrasive grit can damage the floors. 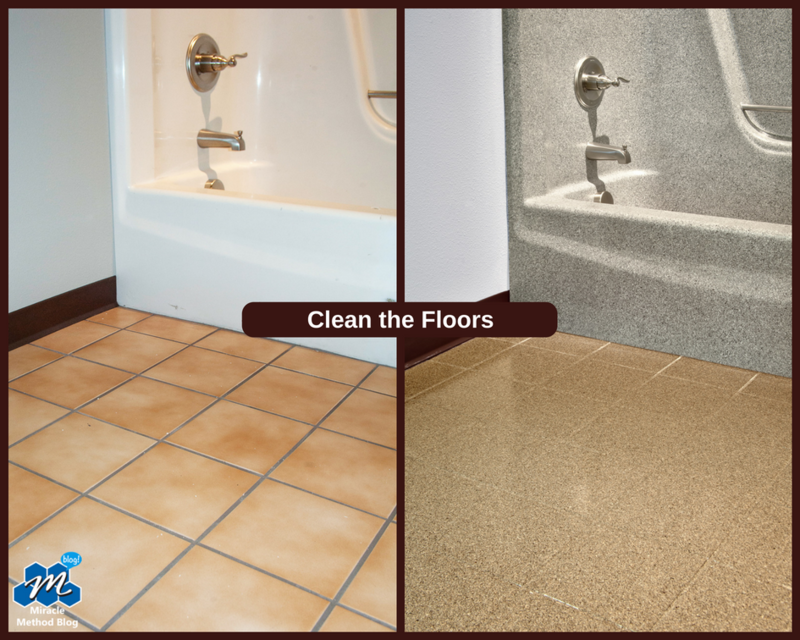 To learn more about cleaning Miracle Method Refinished tile, click here! 4. 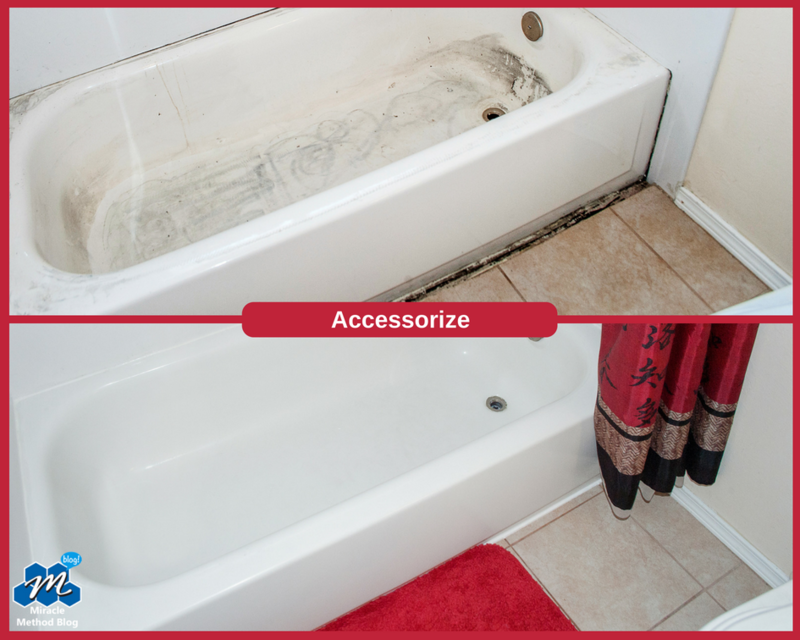 Accessorize – Don’t pack up your bathroom or kitchen accessories until after the house is done being shown. Having a bathroom with a shower curtain and matching bath rug can make it feel like home and help the buyer imagine how they would decorate the space. 5. 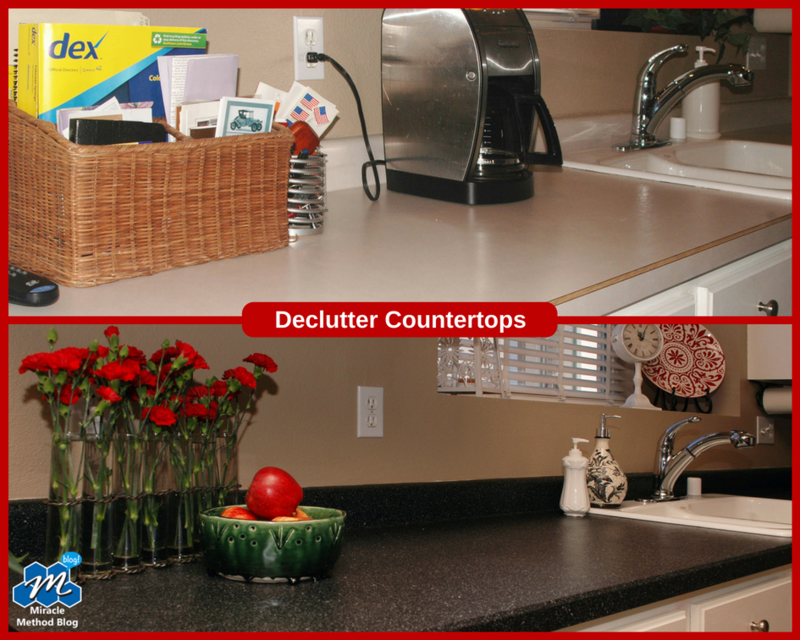 Declutter – The less un-needed items in the area the better and bigger it can seem. Medicine cabinets and kitchen cabinets will be opened by buyers, removing coffee and toasters can help open countertop space as well, but leave a few items, like matching jars or small candles to make the area still remain homey. 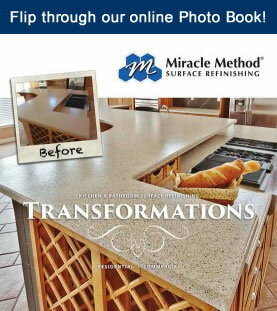 For help updating your bathroom and kitchen with beautifully refinished surfaces in as little as two days, check out Miracle Method. Looking for more reading and quick lists on what and how to remodel your home before listing it on the market? Check out our other blogs on Inexpensive Renovation Tips to Sell your Home Faster and Home Repairs you Must Complete Before Selling. *Note, all above “after photos” are with Miracel Method Surface Refinishing the bathroom or kitchen area for a professional finish that will wow home buyers. Miracle Method upgrades baths and kitchens without the mess, expense and hassle of replacement. As a mobile service, we restore your existing fixtures right in place - saving you time and money! Call 855-212-7337 to be connected to your nearest Miracle Method. Or visit our website to find a location.